This Serbian recipe for meat burek or burek sa mesom is made with ground beef, pork, and lamb. 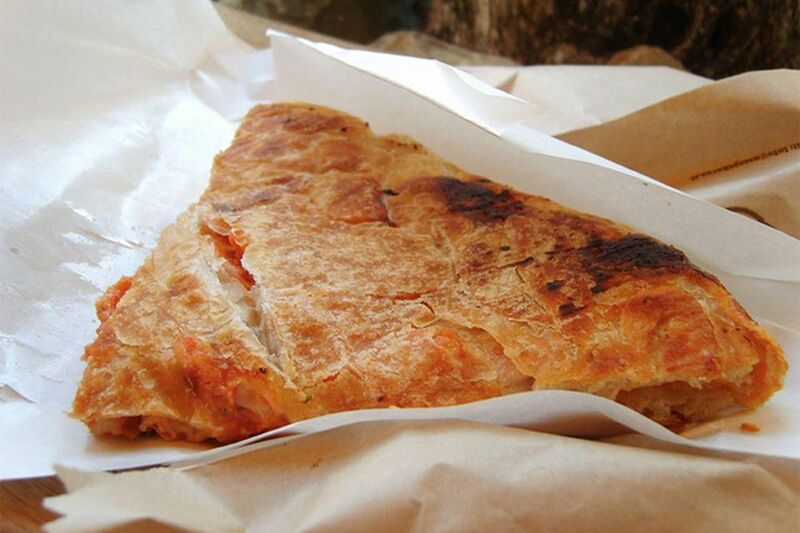 Bureks or savory pies exist throughout the Balkans, Greece, Turkey and the Middle East. They can be formed into horseshoe shapes, coils, cylinders or round pies, or baked in rectangular pans and cut into squares. They can be eaten as appetizers or the main course when they are usually served with kefir to drink. Compare this recipe with this meat burek recipe that is made with ground beef only or this cheese burek recipe made with Monterey Jack and cottage cheese. Follow these easy steps that illustrate how to make burek. In a large skillet, cook the meats, onion, and garlic until meat is no longer pink and onions are translucent. Drain in a colander, discarding the fat. Return to skillet and mix with salt and pepper to taste. Let cool to room temperature. Separate filo dough into 3 piles (about 9 sheets each) and keep covered. Read these tips on Working with Filo Dough. Heat oven to 375 F. Lightly coat a 13x9-inch pan with cooking spray. Lay down 3 sheets of filo dough and lightly brush with oil. Repeat two more times until you've used one (9-sheet) pile of filo. Spread on half the cooled meat mixture. Then lay down 3 sheets of filo dough from the second pile and lightly brush with oil. Repeat two more times until you've used the second (9-sheet) pile of filo. Spread with remaining meat mixture. Then, using the last pile of filo dough, lay down 3 sheets at a time, brushing lightly with oil, until the pile is finished. Tuck any straggly ends down the sides of the pan and, using a sawing motion and a serrated knife, cut the burek to the bottom into 12 slices. In a medium bowl, mix together the eggs and oil. Add soda water and mix slightly. Pour over the burek and let sit 2 minutes. Bake 45 minutes to 1 hour or until golden brown. Let cool in the pan for 15 minutes or so before serving.